Ahhh Milano! 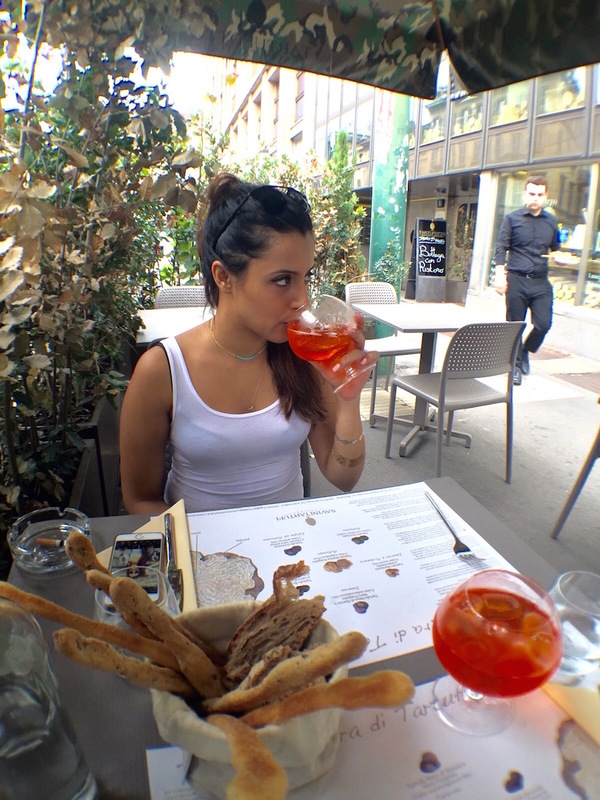 This was our first stop in Italy, we landed at Malpensa Airport and were meeting some friends there a few days later. 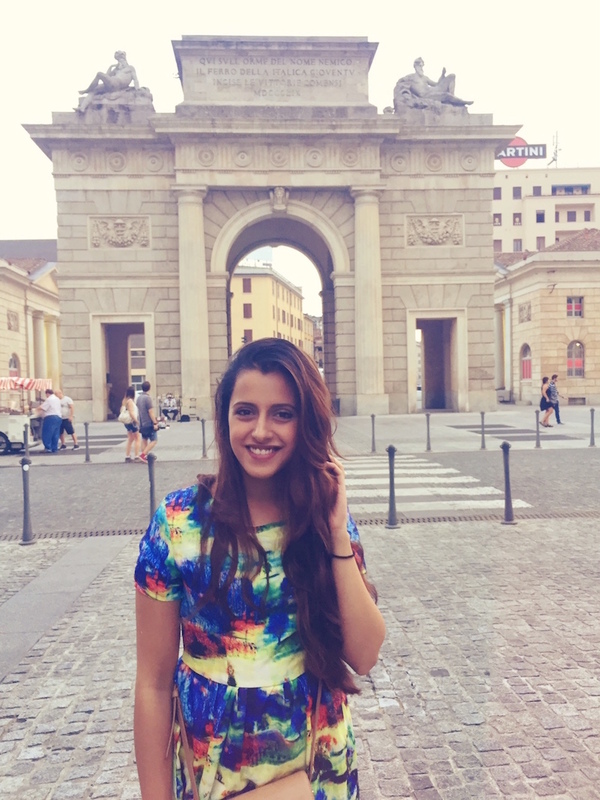 I was tired from my long journey but so giddy and ecstatic at the thought of being in Italy for the first time- finally! I had booked a room on AirBnb in the Navigli area, which is an enchanting neighbourhood with canals on either side. Long considered an impoverished locality, Navigli began changing when artists started moving into this area to find inspiration in the quaint and charming district. 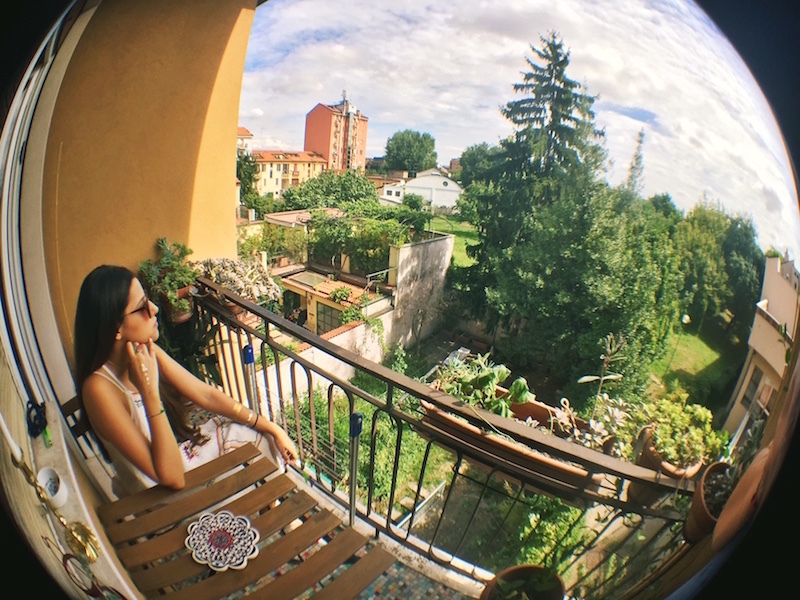 Today, Navigli is a lively and young neighbourhood with a university, many students, and lots of restaurants and bars along the waterways, which spill out onto the streets & stay open late during summer. 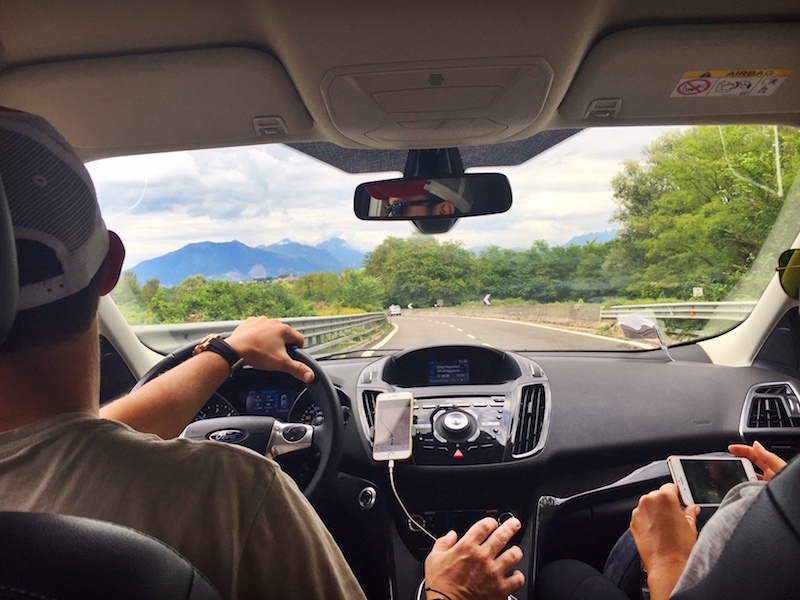 The time of year we decided to come to Italy was also the time of Ferragosto, a holiday in Italy on August 15th where the locals take 2-3 weeks off and close all businesses. Most locals will head for the beach, and we were very afraid that we wouldn’t have anything to do and everything would be closed, but this is not the case. The cities are definitely emptier than usual but this isn’t necessarily a bad thing, less tourists, shorter lines to get into the sights and a more relaxed atmosphere. Plenty of restaurants are still open so you’ll have lots of options. If you’re thinking of going around this time then don’t get fazed by all those travel websites that say this is the worst time to go, I would definitely recommend it and say that it made no difference to our trip! In terms of transportation, there are many options between buses and the metro. From the airport there are trains that go straight into the city, and you can buy a single use ticket. For within the city I would suggest you buy a 48 hour metro ticket which costs about 8 euros, if you plan on exploring the entire Lombardy region as well as Milan there is also a 1,3,4, or 7 day ticket that lets you use any means of public transport- from buses, metros, and inter-city trains to boats in certain towns. These cost between 17 and 43 euros depending on which one you buy. 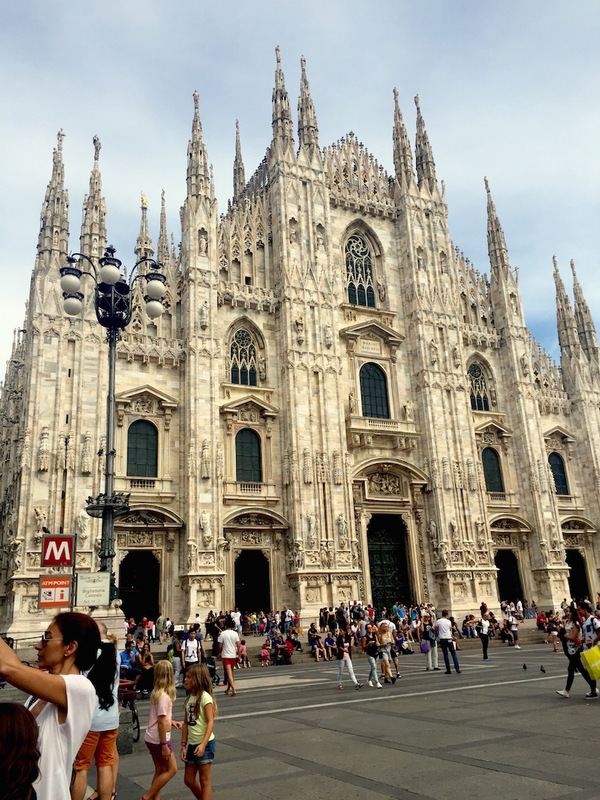 For us, it only took a 10 minute metro ride to get from our AirBnB apartment in Navigli to the historical centre of Milan, where everything is pretty much within walking distance. 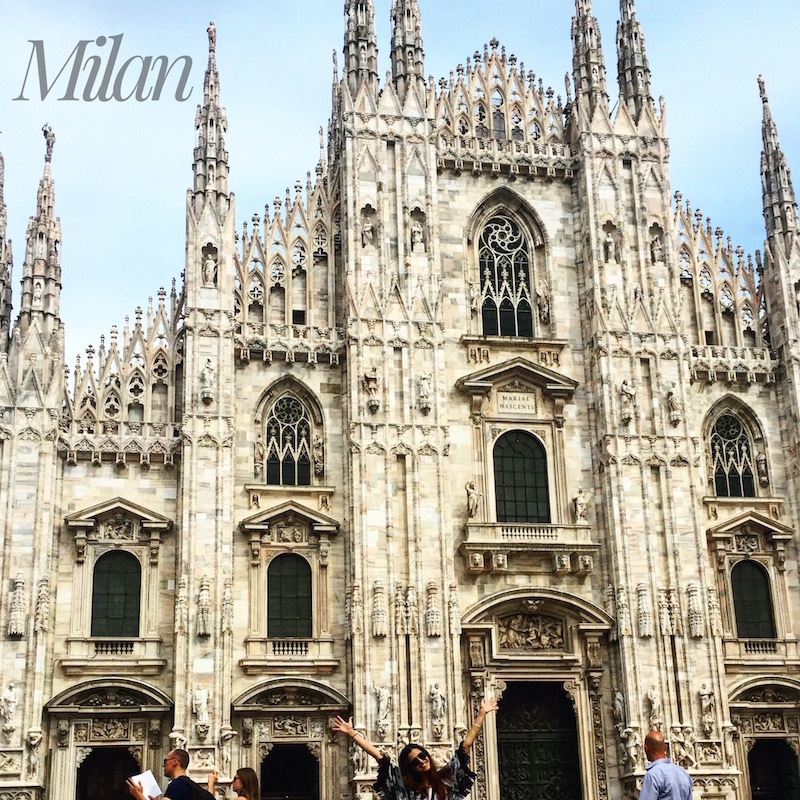 I was only in Milan for 2 days, so we tried to pack in as much as we could without getting taking on too much. On the first day we only had the evening since we landed that afternoon, so we decided to walk around and just soak it all in during our first few hours in captivating Italy! I fell in love slowly (maybe that was the long flight from Bombay) but then all at once, at first with the overwhelming sensation of being in such a beautiful place with gorgeous architecture everywhere and beautiful sights surrounding me, then, with the finer details- stone paved sidewalks, scatterings of age-old sculptures and monuments in places you’d least expect them, inviting little cafes and wine bars on every corner, the smell of pizza cooking in wood-fire ovens, the smell of fresh gelato, sounds of laughter from people whose bellies were full of wine & pasta. I was ecstatic beyond words. 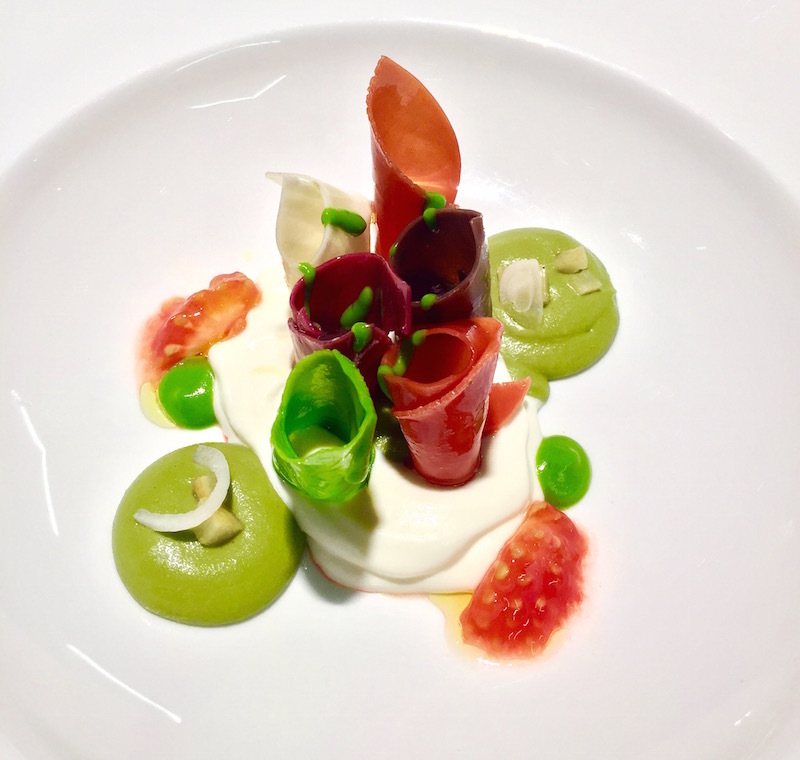 Dinner tonight was at Michelin star restaurant Alice (more on that below) which is inside the Eataly building at Piazza XXV Aprille. 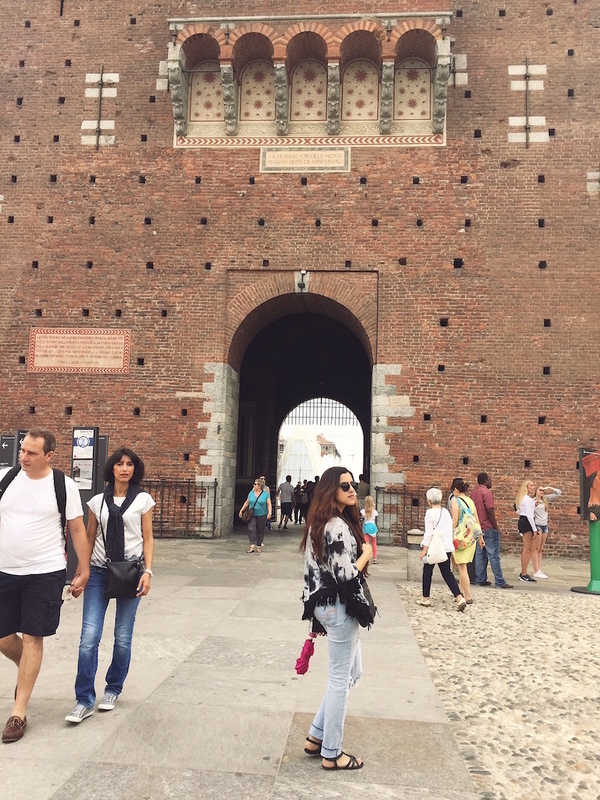 There is a stately and impressive arch called Porta Garibaldi, which was once a city gate, right outside in the piazza and many adorable bars and restaurants in the area. I marvelled at the old yet modern feel of Milan, it’s the financial capital of Italy and definitely has a slight corporate feel to it. Our Airbnb host told us that everything in Milano closes pretty early, generally around 11 (the Milanese love their beauty sleep before work the next day), except the Navigli canal-side during summer, and certain other spots around the city. Eataly itself is something delightful to see, 3 massive floors of gourmet Italian meat, produce, wine and cheese, with a separate restaurant for meats, seafood, pasta, pizza and a deli. You could get lost in there! 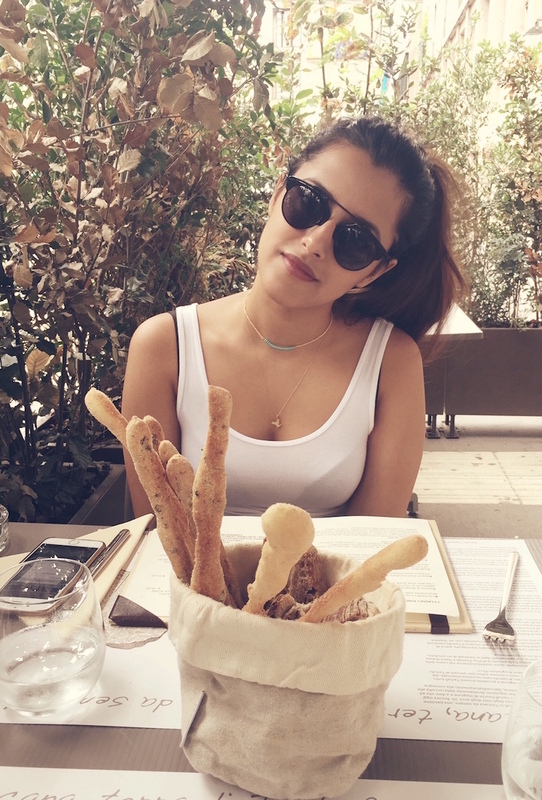 Ive been to the Eataly in NYC and its also equally glorious & one of my favourites for all things Italian, whether I want to cook, grab a bite, or walk around the store with a glass of wine in hand marvelling at all the mouthwatering things on offer. Given more time I would definitely buy ingredients from here to cook myself a feast. 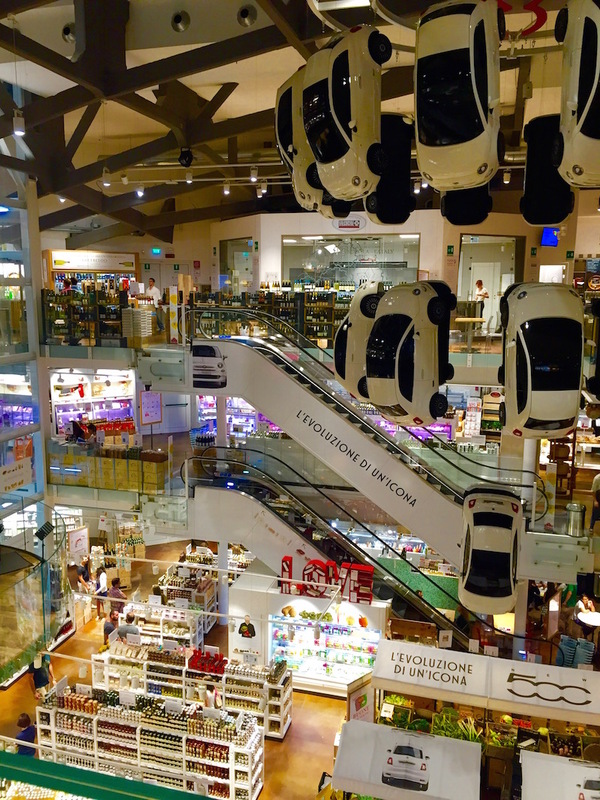 Eataly Building- 3 floors of gourmet Italian dreams! Since it was our first night, we wanted to splurge and have a truly unforgettable meal. 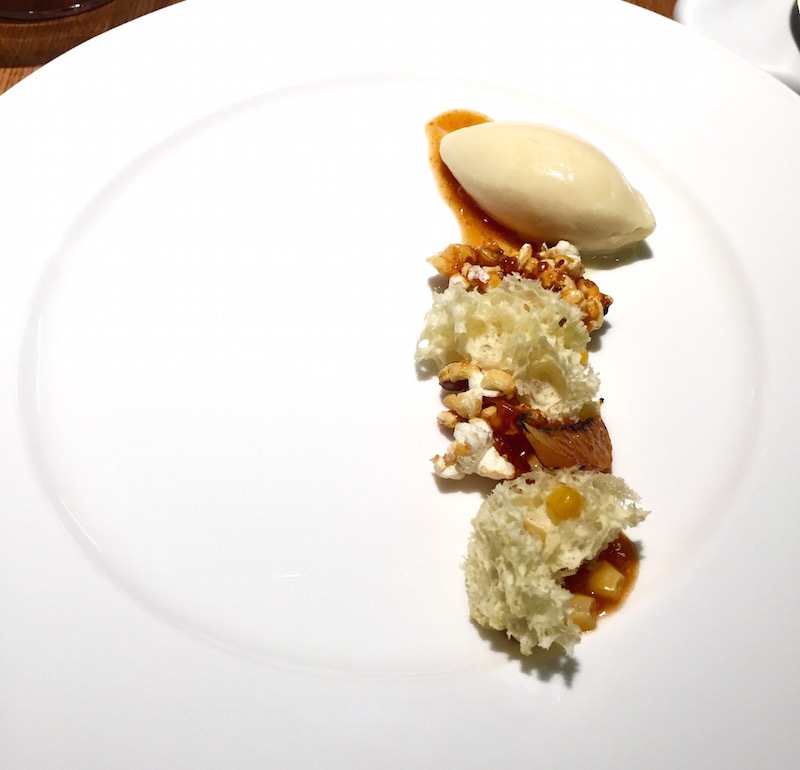 We also wanted to eat at a few Michelin star places on this trip, and this was the first one we thought to try. 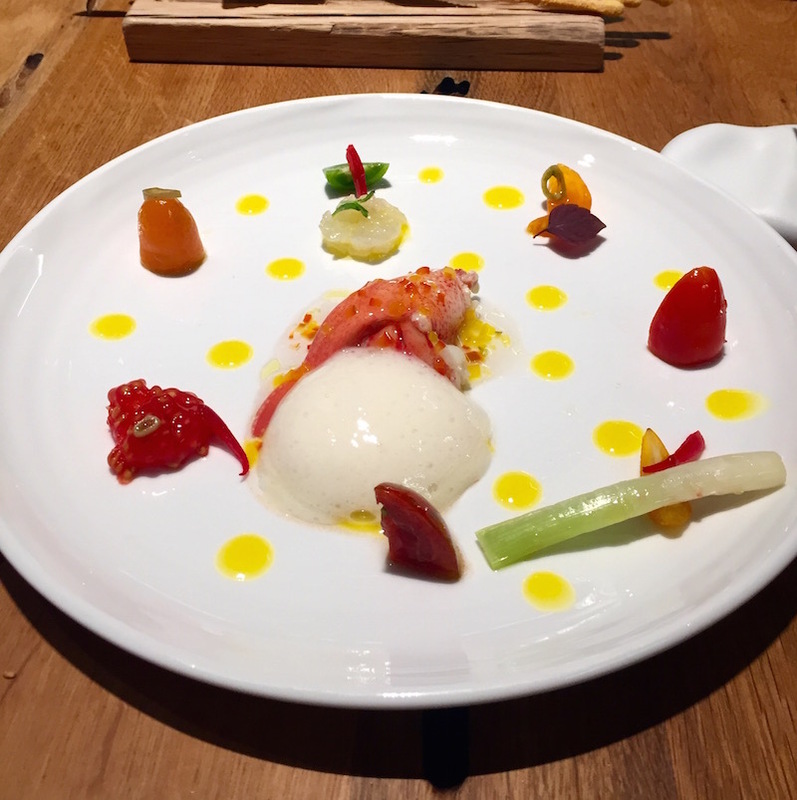 The Michelin Guide is a prestigious list of restaurants that meet exceptional food and service standards, restaurants can be 1, 2, or 3 stars, and even in a city like Milan there are only a handful of Michelin starred restaurants. 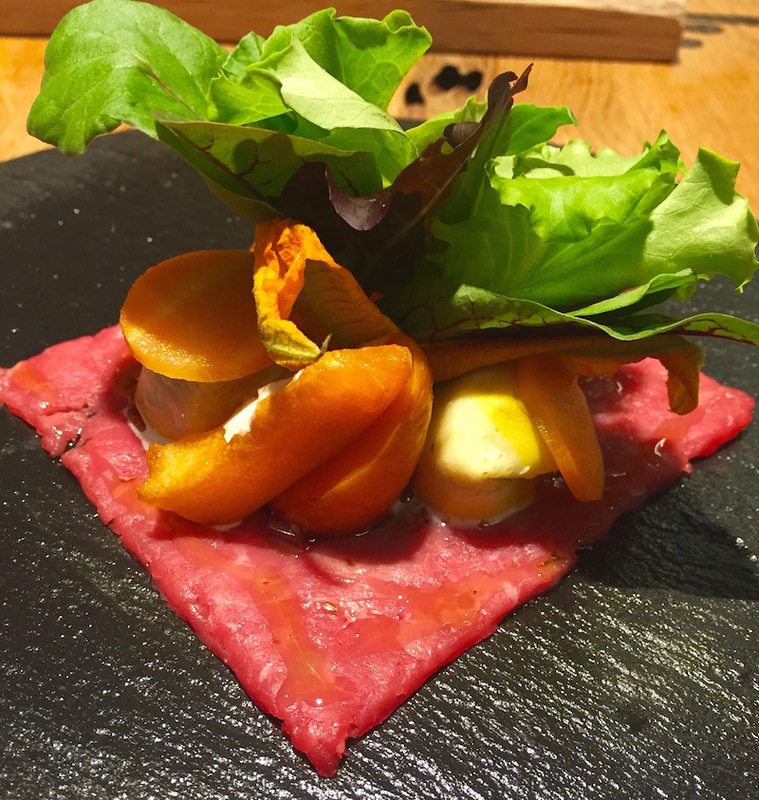 It’s located on the top floor of the Eataly building at Piazza XXV Aprille, and has a modern, up-scale atmosphere. 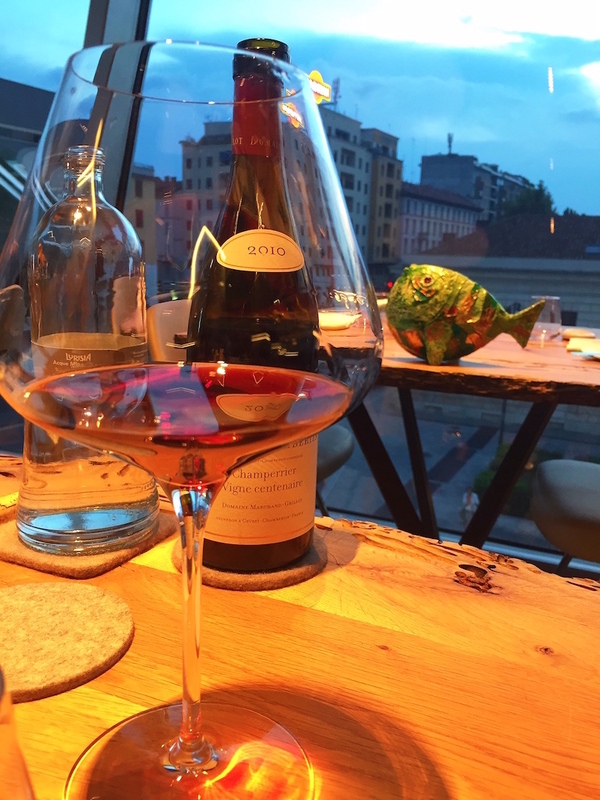 The cuisine focuses on experimental and modern takes on traditional seafood dishes from around Italy, and they have an excellent wine list. Our table was beautiful- right next to a whole wall of glass to look over the piazza at the blue glow of dusk, dimly lit lamps hung above each table to give an intimate feel, there was interesting petrified wood furniture & clean, modern accents everywhere, including the cutlery and dinner ware. We decided to go with the 7 course prefix menu each so we could try lots of stuff each and a bottle of 2010 Gevrey-Chambertin Pinot Nero, which was medium-bodied, went with both the seafood and meat & served in the most exquisite, tall wine glasses. 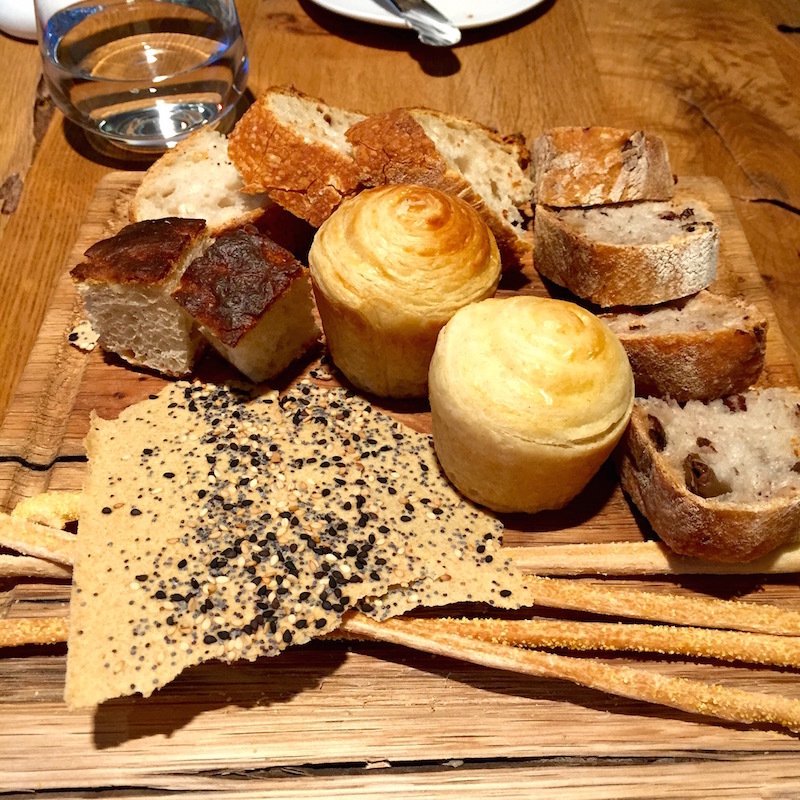 The bread basket and amuse bouche were both varied and super delicious (I HAVE to mention this bread that was like the lovechild of a freshly made croissant and a buttermilk biscuit. I don’t know what bread that was, but it’s the best thing I’ve ever tasted). The prefix menu included everything from oysters, lobster catalan, & sea urchin spaghetti to beef carpaccio and fish. 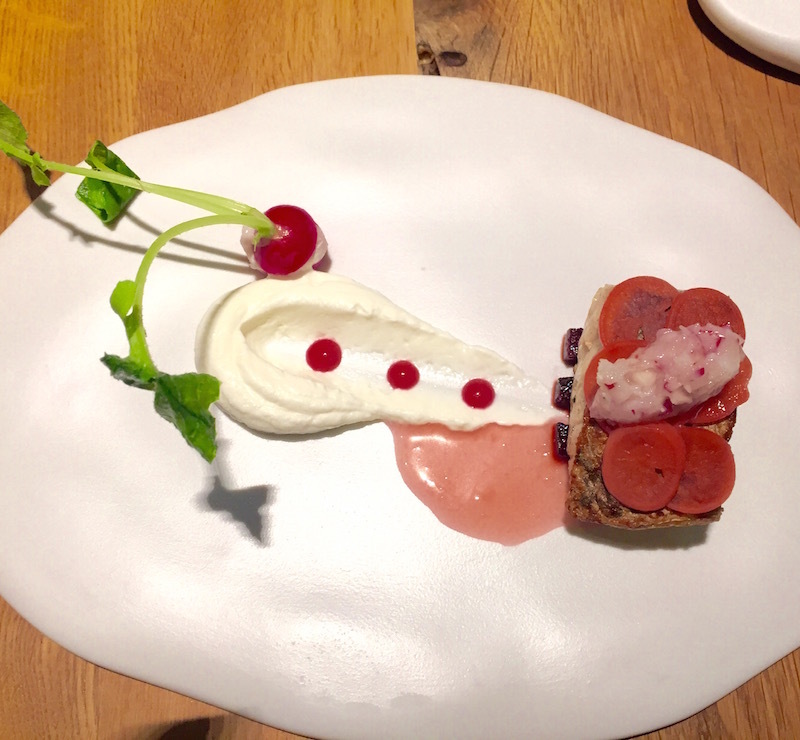 Everything was plated absolutely beautifully, and you could tell there were many complex techniques used on each plate of food. 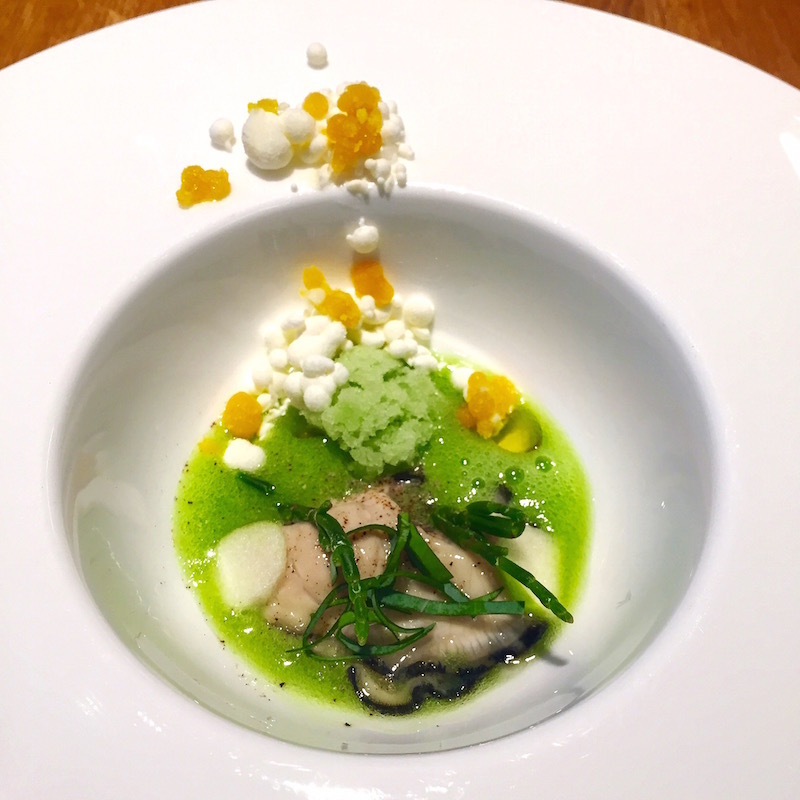 Some standout dishes were the oyster with green apple granita & sour cream and passionfruit spheres, the spring pasta with mascarpone, pesto & fresh tomato, and the pan seared croaker with yogurt sauce, beetroot elements & onion gel. There was a slight problem with the lobster dish as J and I both found shell in our first bite, when mentioned to our hostess, she apologised profusely but did not take the plate away for a good 15 minutes, and that too only when she noticed we hadn’t taken another bite and came to ask us what was wrong. I would expect better service from a place like this, in no restaurant are small pieces of sharp shell acceptable in lobster dishes. The second one they served us was bang on. Now we come to the savoury sweet popcorn flavour dessert! It was so interesting and I’ve definitely never tasted anything like it before, the general taste was of salted caramel popcorn. Just when we thought we would burst from eating so much, they sent over a plate of assorted handmade chocolates, macarons and chocolate lollipops with the bill. Everything about this restaurant was beautiful, from the decor to the cutlery and china to the plating of the food, the food itself had some standout dishes and some average in terms of taste and flavour, there was no doubt many advanced cooking techniques used in every dish. But the experience would improve considerably if the service is better and more attentive. We found the staff to be a bit curt and slightly egoistic, and maybe thats because this place has a reputation of being great, but I would expect better service at any decent restaurant, let alone a Michelin star one. A great experience, but probably wont be going back. If you ever end up going to Alice, I would love to know what kind of experience you had, so write in to me anytime! 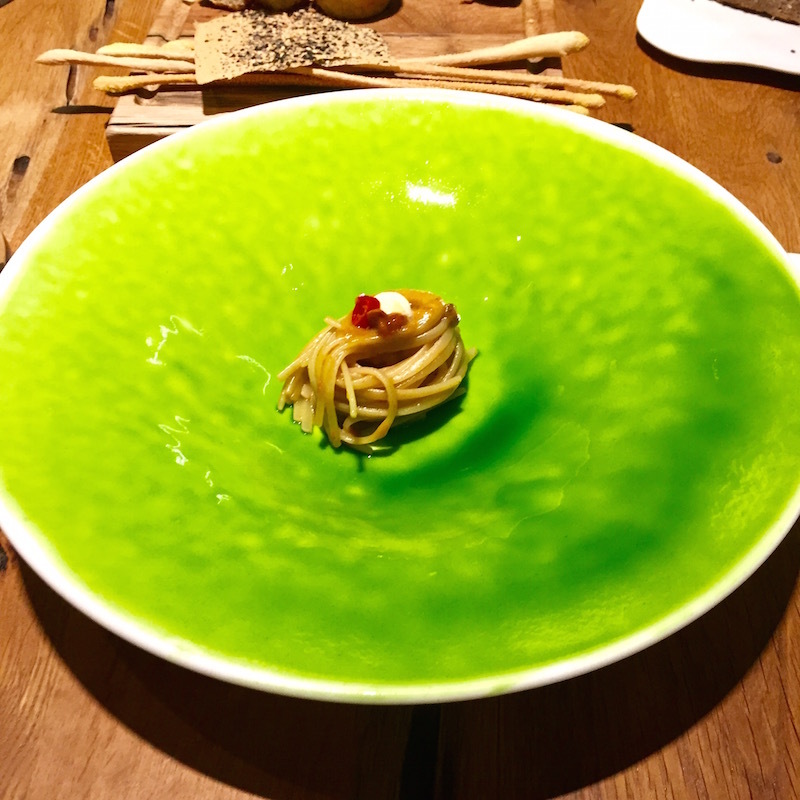 Hand made pasta with sea urchin and a seaweed glaze. Spring Pasta, my favourite course! Post dinner we called it an early night, had a nightcap at one of the many cute little bars in the area and headed home. We started day 2 well rested and ready to explore! 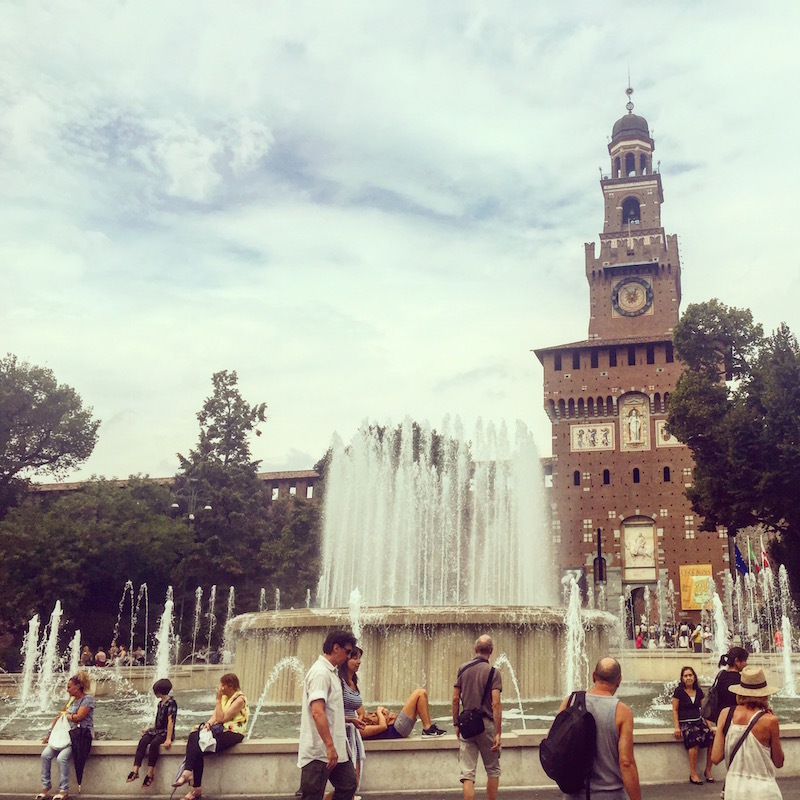 Grabbed a cappuccino and a pastry (look for small cafes where you see lots of locals) before heading to our first stop, Parco Sempione, a large and beautiful park situated behind the palatial Castello Sforzesco. 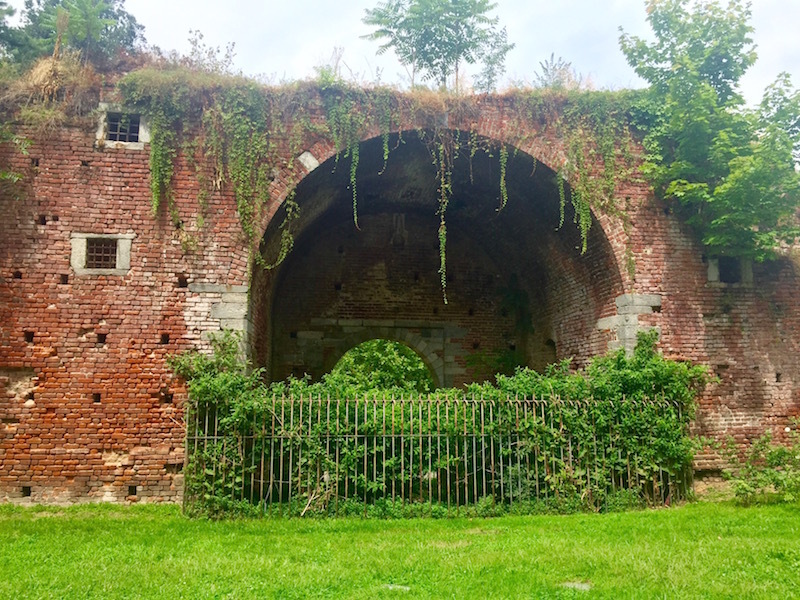 We meandered our way through the lush green gardens sipping on our delicious, authentic Italian coffee and arrived at the park-side entrance of the castle. This place is enormous, and more like a fortress from Game of Thrones complete with motes, lawns, and walls as high as the eye can see. 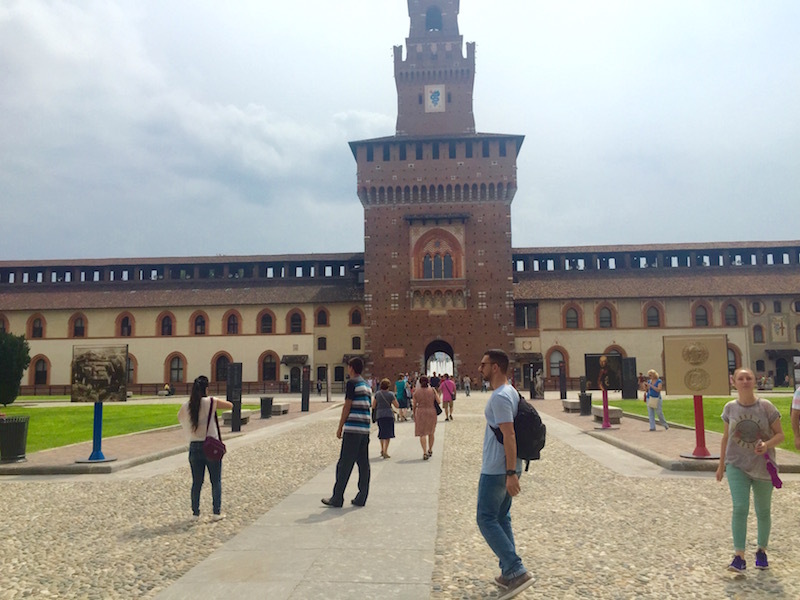 Castello Sforzesco was commissioned in 1368 by Galeazzo Il Visconti, Lord of Milan, and was renovated and expanded through the years by many rulers, including Napoleon. 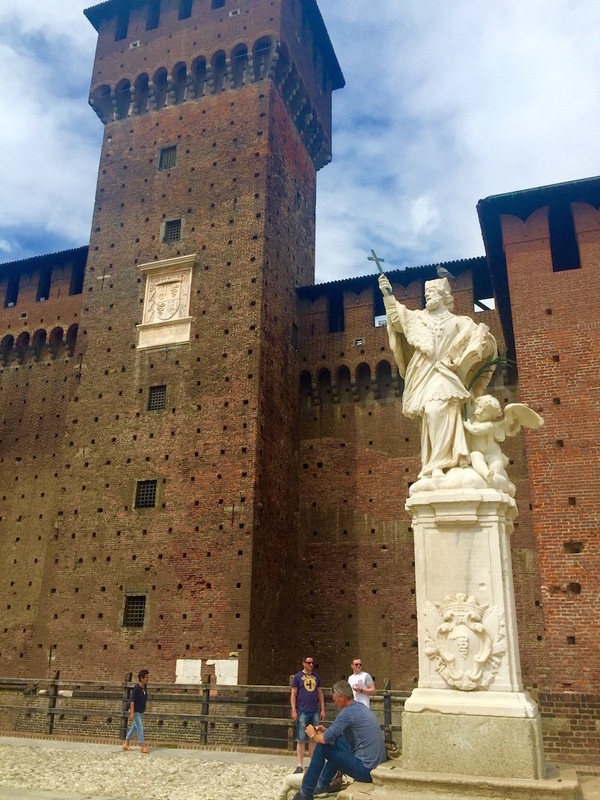 The castle holds many museums as well as Michelangelo’s last sculpture (the Rondanini Pietà) and Leonardo da Vinci’s ‘Codex Trivulzianus’ manuscript, for all you art and history lovers. There is a fountain out front where you can sit and enjoy the cool mist on a hot summer day. Restaurant inside Castello Sforzesco. Love the contrast of traditional and modern in the same space. You can’t really go wrong when truffles are involved, and this restaurants’ specialty was just that- truffles in every damn thing on the menu (not complaining)! 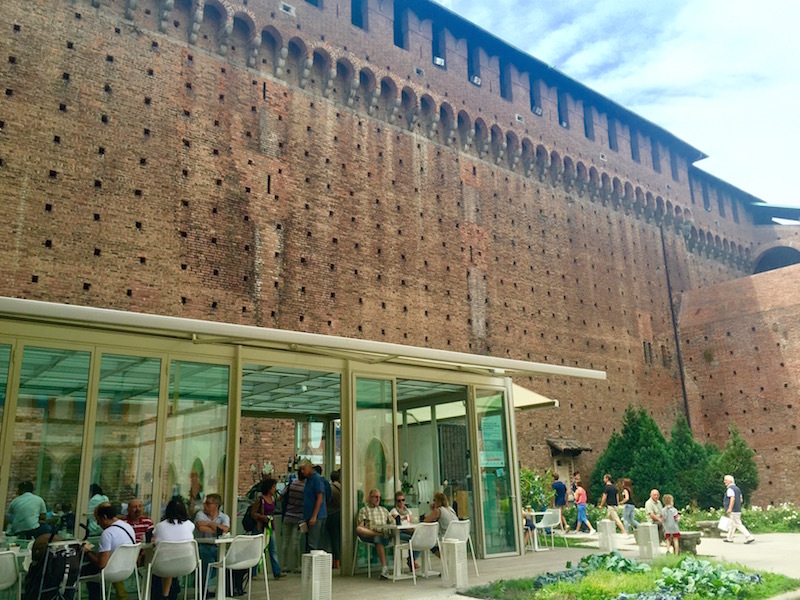 Its a small but well-designed, warm and modern space just near the Castello Sforzesco, and we chose one of the tables outside on the sidewalk so we could soak in the Milanese sights & sounds while eating. We were helped by a wonderful server (I wish I remembered his name!) who was all smiles and suggestions, and kindly walked us through the entire menu. If we had him as a server at Alice, my review would have been far more positive (hahaha). 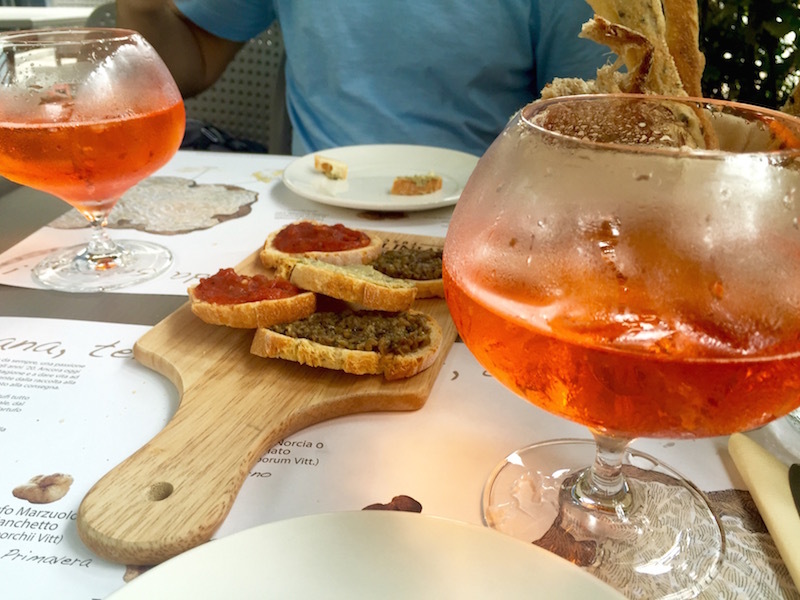 We started off with an aperol spritz each- THE cocktail the locals and everyone else drinks in the evening during apertivo, or pre-dinner drinks, and a platter of mixed bruschetta. 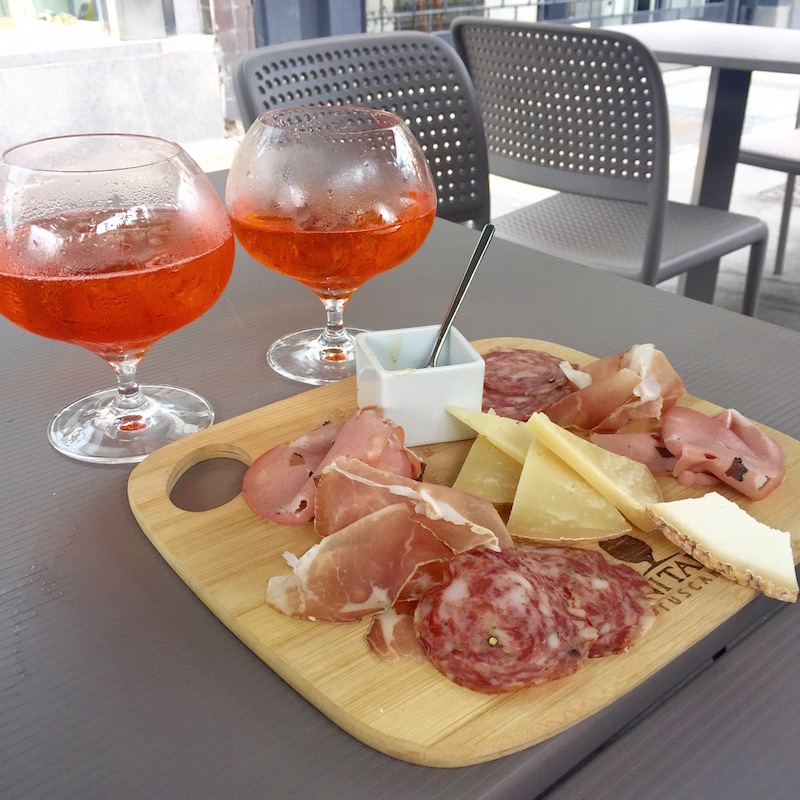 Aperol spritz is classically made up of Aperol liquor, which has a bitter orange sort of taste, prosecco, soda and sliced oranges and is a very traditional Italian cocktail. 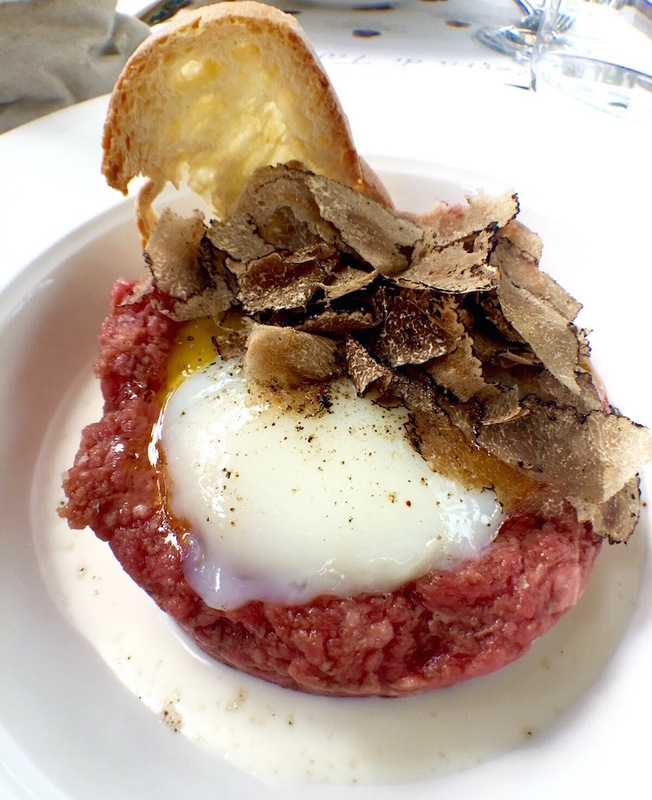 We then went on to our mains- a bottle of Sardinian rose and I had the potato, asparagus, and 62 degree egg topped with stacks of shaved truffle, for him- the beef tartar with a soft egg and again stacks upon stacks of shaved truffle delight! The food was so good that I don’t think we spoke for the entire 30 minutes it took us to eat, everything was beautifully balanced and the truffles were fresh and flavourful. They served us complimentary truffle liquor, which may be one of the best things I’ve tasted if I hadn’t tasted the truffle Tiramisu with shaved truffle and truffle soil at the bottom right after that. If heaven had a taste, it would be this. If I had to eat one dessert for the rest of my life, it would be this. If I could make love to dessert, it would be to this. Ok so you get the point, basically it was jaw-dropping-smack-you-in-the-face-with-flavour-holy-heavens-above-please-save-me delicious. 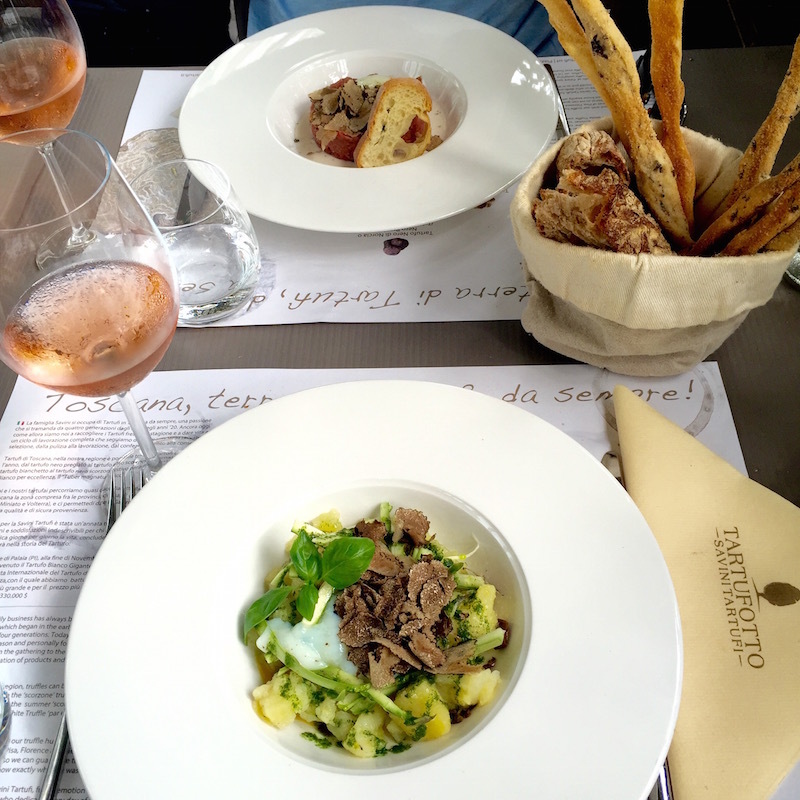 This restaurant is a MUST for anyone visiting Milan if you like truffles (if you don’t- get out. Just leave.) Tartufotto, I still dream of you every night, mi amore. Waiting for food, my favourite hobby! Meat & cheese platter. 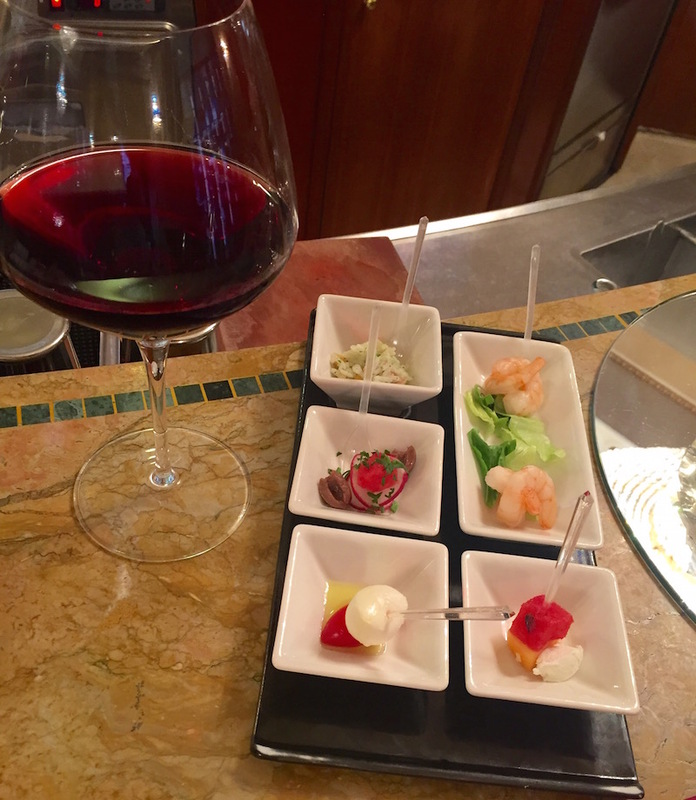 A must every single day when in Italy. 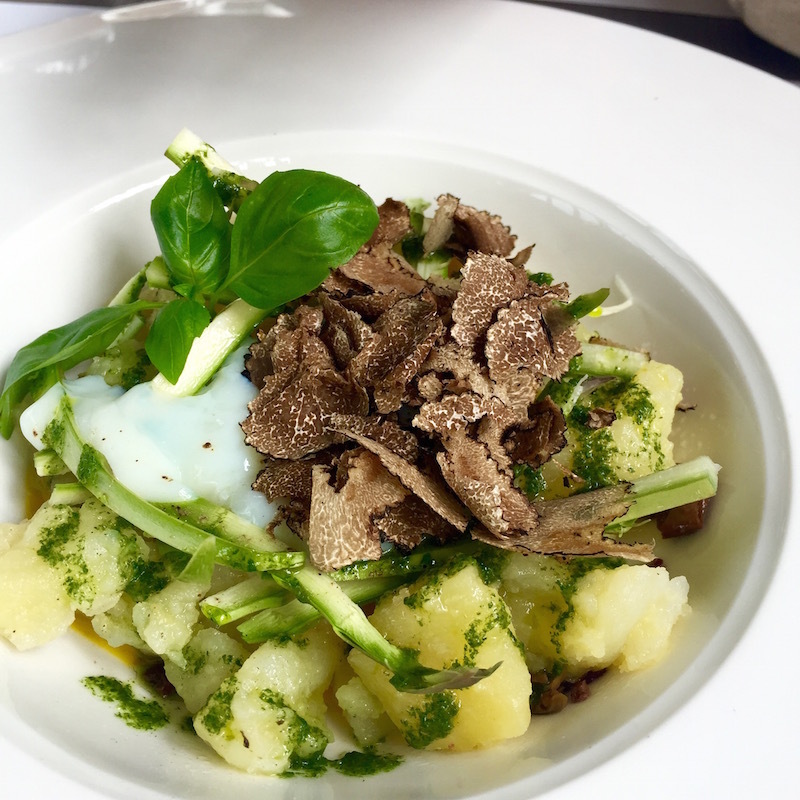 Potato, asparagus and 62 degree egg with mountains of shaved truffle. DROOL! The best dessert in the whole wide world. 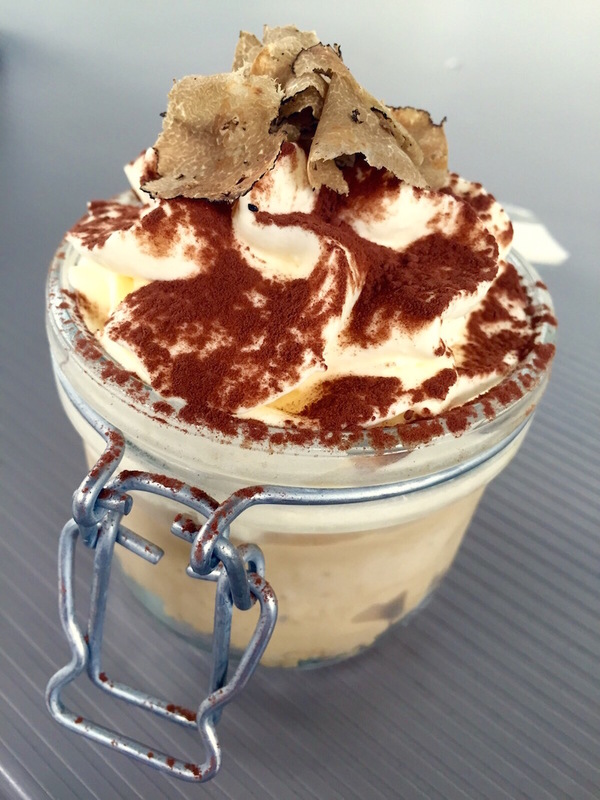 Tiramisu with shaved truffles and truffle soil at the bottom. Demolished 3 of them. After lunch close to the castle, we strolled towards the Duomo, triple scoop of gelato in hand. 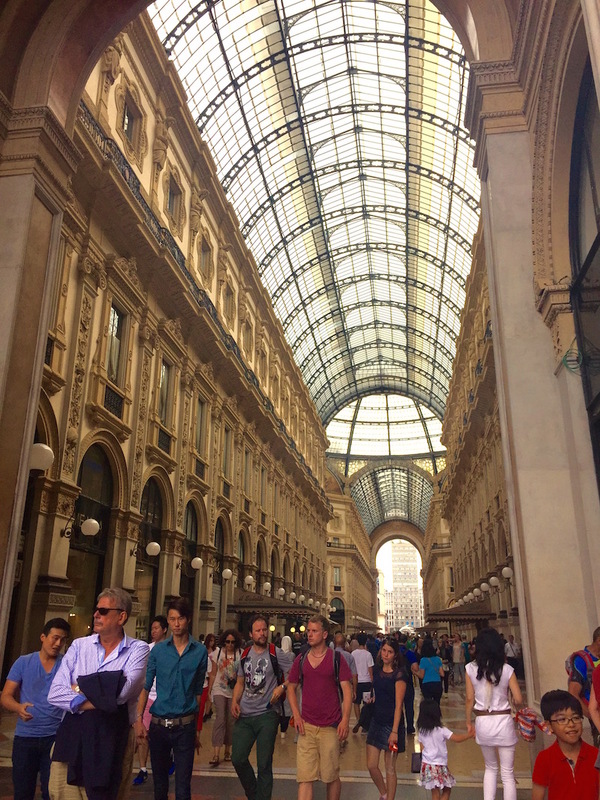 On our way, we explored the Galleria Vittorio Emanuele II, one of the oldest shopping malls in the world, which sits right next to the Duomo. 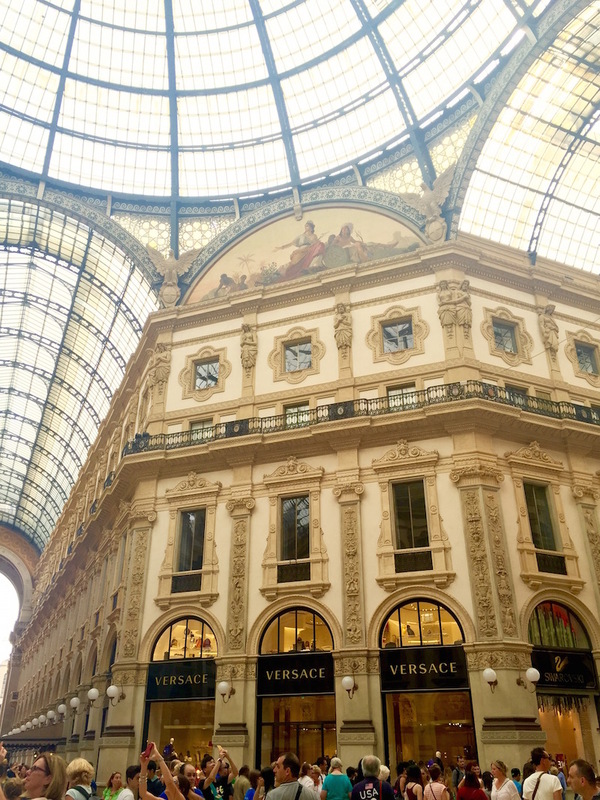 The stunning outdoor shopping arcade opened in 1877 and houses some of the top Italian brands such as Prada and Versace. Galleria Vittorio Emanuele II, one of the oldest shopping malls in the world. The architecture of The Galleria is breathtaking. Always time for a glass of wine in between sightseeing. At one of the restaurants inside Galleria Vittorio Emanuele II. 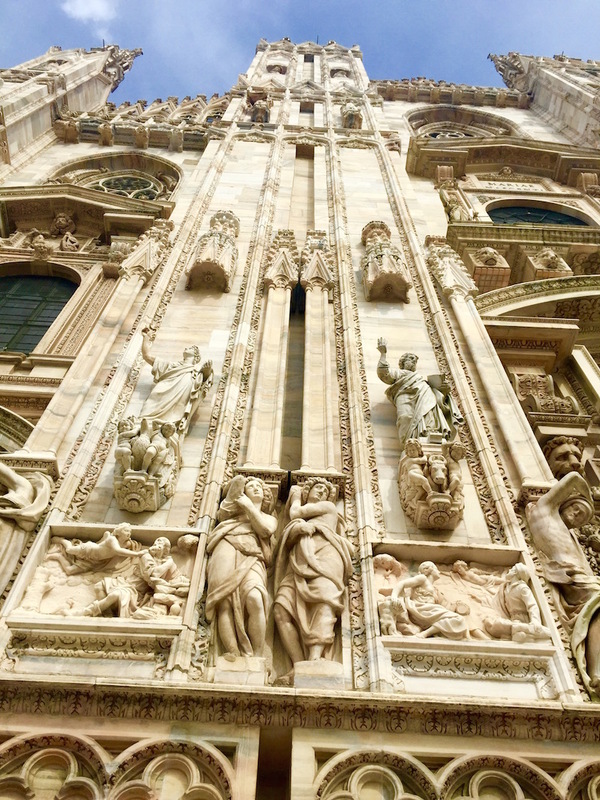 The Duomo or Cathedral di Milano towers over you like a giant in the sky. The architecture is in the Gothic style, complete with spires reaching up towards the heavens, pointed arches, and every surface of the cathedral utterly engulfed in intricate carvings. This cathedral took 6 centuries to make, and you can definitely see why. Sit in the piazza out front and marvel at this colossal structure- the 4th largest cathedral in the world and the 2nd largest in Italy. There are street performers everywhere, serenading you with live music and dancing, and this definitely adds to the charm of being in Italia. We didn’t have time to go inside (boohoo) but if you are here definitely wait in line and see the inside. As a general rule of thumb when you’re sightseeing and visiting religious places in Italy is that you should take care to cover up a little bit- something till the knees and shoulders covered for the women and men should also avoid sleeveless tank tops. You won’t always see every tourist adhering to this but it is the respectful way of doing things according to many people we spoke to. Often you will visit churches while there may be a sermon or mass going on, and you will see people dressed quite conservatively, and occasionally you will not be let inside by security at certain cathedrals and sights (such as The Vatican) if you are very skimpily dressed. 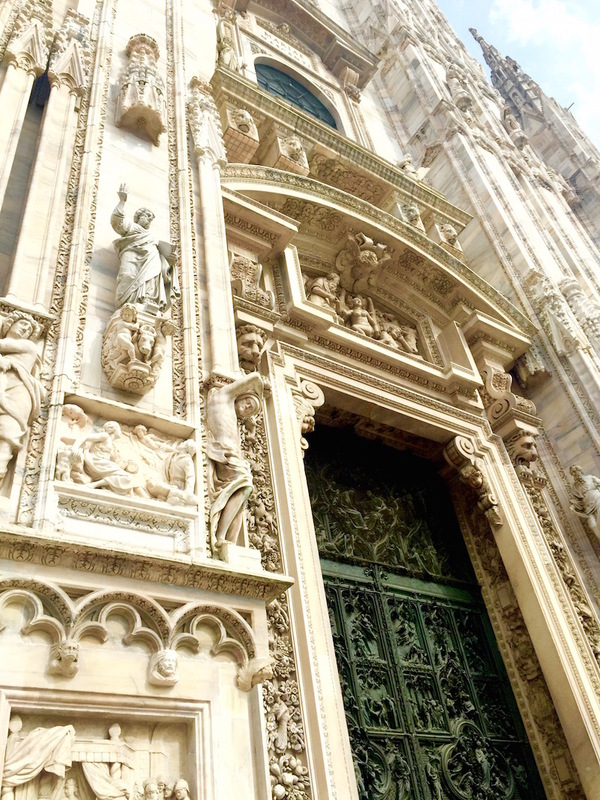 Milan Cathedral, looks far larger in real life! Gothic style architecture and all of the insane details that make this cathedral so unique. More exquisite carvings on the facade of the cathedral. A close up of the bronze door, absolutely covered in intricate metalwork. After the Duomo we were headed to the World Expo, which was being held in Milan that year and had over 145 countries participating. Historically, the World Expo or World Fair is a place where every country can come and display their latest inventions and technological advancements, art, food, entertainment etc and the first one was in the mid 1800’s in England. Since it kept popping up all over the place while I was researching, we decided to check it out for an evening. Milan was hosting the fair after more than 100 years. The Expo was open from May 1st-October 31st and each participating country had a pavilion of their own design. 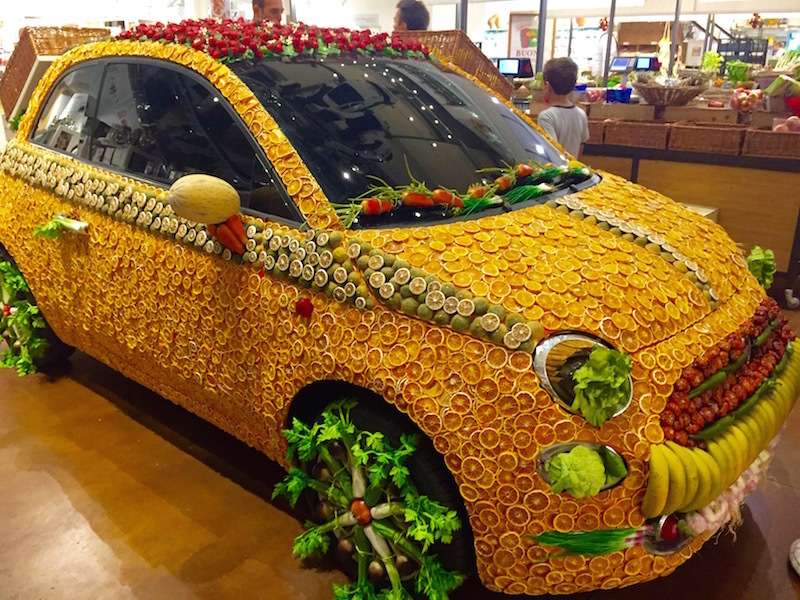 The theme at the 2015 Milan Universal Exposition was Feeding the Planet, Energy for Life. 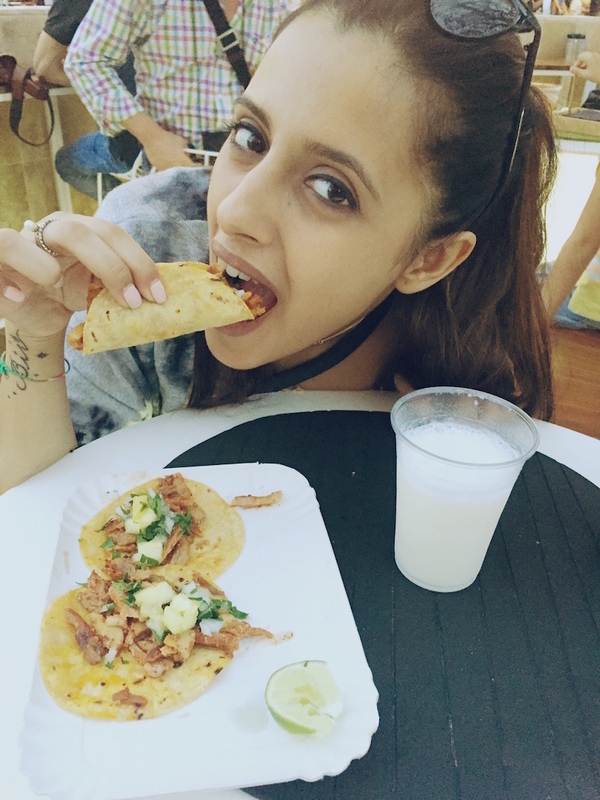 It encompassed innovation, culture, traditions and creativity and how they relate to food, so we literally had to pick what to eat out of 145 countries (a mammoth task to say the least). We finally ended up at the Japan and Mexico pavilions (you will slowly figure out my obsession for Mexican food) for dinner and Belgium for a chocolatey finish, post which we were seeing Cirque Du Soleil (if you don’t know who they are, please YouTube them) who were performing every night at the Expo for the entire duration. A large reason we even decided to come here was to see them perform, and it was worth every penny and more! 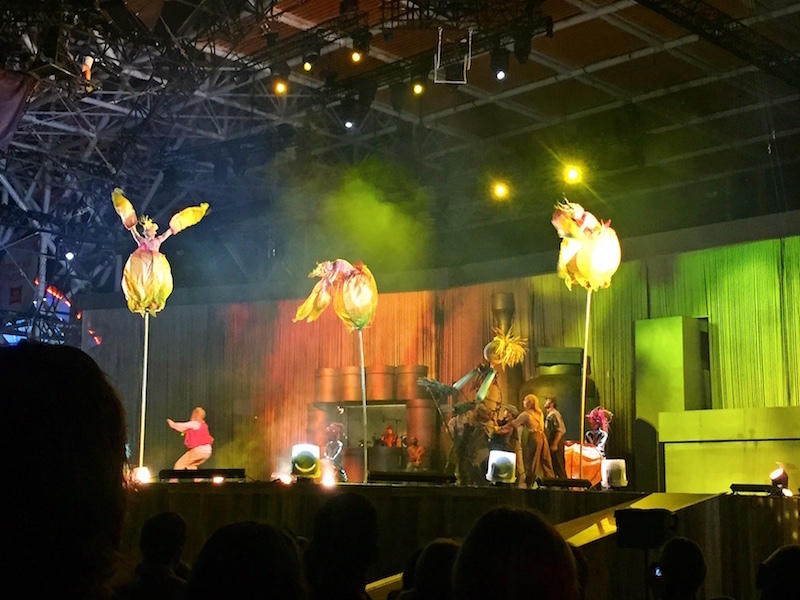 The acts were truly breathtaking and apart from just circus acts there was also a storyline to the whole show. I have never seen people bend, fly, jump and dance like that. If you ever have the opportunity to see them live you have to do it! I can’t recommend it enough. Post the show we were exhausted and decided to get a good nights rest. We ate at standard Italian eateries as well, nothing major to mention there, just the usual pizza and pasta and wine- still wonderful and delicious. 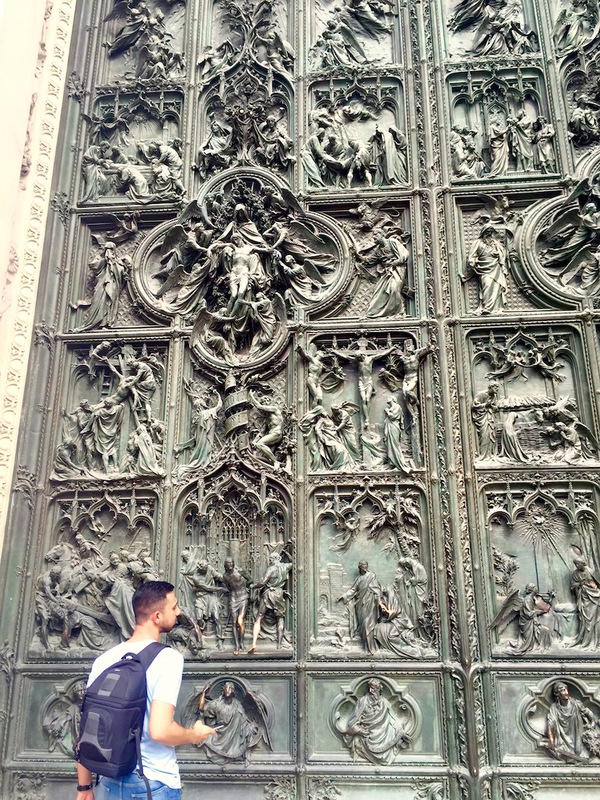 Walked around Milan aimlessly for hours letting the “la dolce vita” Italian vibe seep into our minds and souls. Tomorrow, our travel companions would land from L.A, pick us up and off we would go on a road trip to Lake Como and then ahead to Venice. So up next in my travel diaries- Bellagio and the various small, picturesque towns we visited in the Lago di Como area.